Brian is from New Jersey, USA. 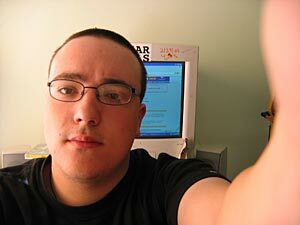 He has been a part of the FrankBlack.net forum since October 2002, and became a moderator in January 2005. Brian owns/operates the Franklin Recording Co. (www.thefranklinrecordingco.com) when he isn't at his day job. He loves the New York Mets in an unhealthy way. Some of his favorite things to do include playing music (on various levels of skill, he plays guitar, bass, keyboards, banjo, low brass instruments and drums), watching films, reading books, cooking, watch baseball games and doing crossword puzzles. He is currently obsessed with MLB 2005 for Playstation 2. Some of his favorite non-Frank Black music that isn't part of the typical indie rock fan's collection include the Bad Plus, Os Mutantes, Sufjan Stevens, Lightin' Wells, Royal City, R.Crumb and His Cheap Suit Seranaders, Knife and Fork, Mosquitos, Bill Frisell, the Weakerthans and Simian. And some obviously great songs are "Victoria" by the Kinks, "Exhausted" by the Foo Fighters and "Letterbox" by They Might Be Giants.